CPT - Crawler Proven Technology Steering Stabilizer Kit for 1971-80 Scout II, Terra or Traveler. 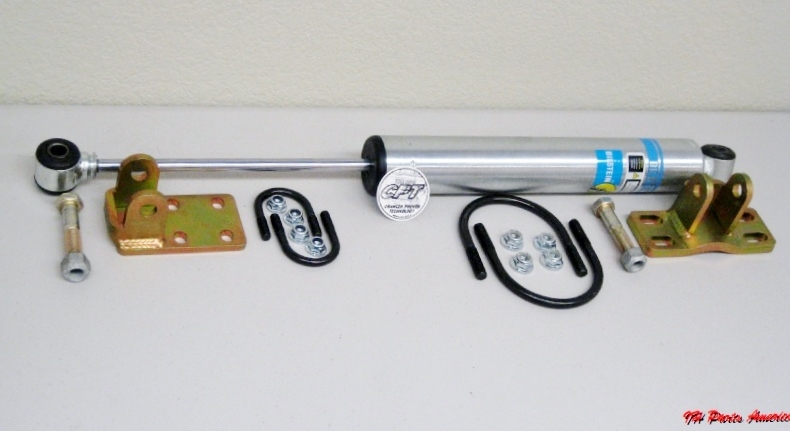 Finally a steering stabilizer kit that matches those awesome Bilstein shocks with hi quality CPT brackets that are coated in a rust preventing gold nickle coating. For Scout II with Dana 30 or 44 front axle and stock spring under axle suspension. Although one does come with the stabilizer it is not recommended that it is used. We found the boot gets bunched up when collapsed and catches on the ubolt heads. Will there be kit for the 80 and 800. We're hoping the current mounting brackets with a different stabilizer part number will work on the Scout 80 and 800's. Once we get a chance to test one out we will post up if or when we are successful.